Shen Chun decided to take care of sect matters before attacking House of Paper Shadows and to gather his alliance to discuss strategy. At this time, Red Crane, who had recently been introduced to the sect leader and who had been instructed by Da Mei Mei, asked for an audience with him. Red Crane said he felt his skills would be of little use against the House of Paper Shadows in a direct assault and asked if he might instead go to the Banyan to aid in other ways. Shen Chun agreed with this and dismissed him. You and your wife and not welcome in Zun City from this day forward. Your behavior at the banquet the other day was disgraceful and rumors have reached me that you killed not one but multiple innocent people. And before you do something like try to burn me alive, as you did those poor villagers in Cha, know that I have sent formal denunciations of you to all the leaders of the martial world. Shen Chun understood this to be the work of his impersonators. He examined a map and took note of where they had been seen, concluding that this must be the work of multiple impersonators or two impersonators capable of instant travel between places*. He spoke with his inner circle of people and discussed possible approaches to the House of Paper Shadows. Lady Plum Blossom suggested gathering all the sects, addressing the matter and then using that as an opportunity to make an official statement regarding the impersonators. Shen Chun agreed and sent out word for the sects to join at his headquarters. They also discussed the possibility of poisoning the food supply at the House of Paper Shadows. Meanwhile, Red Crane went to Zun city and got an audience with Chief Wan Li. Appearing before the chief he asked permission to organize a tournament in the city to help the martial world find talent to face the Yan. Chief Wan Li seemed displeased with Red Crane's initial suggestions but told him that he would give him funding to organize such a tournament if he could beat the captain of his Black Dragons in a match. Red Crane agreed. Stepping forward with a spear, the captain of the Black Dragons got into a stance. Red Crane stood in his two spear stance. The captain threw his spear and rushed forward to deliver a kick as the spear struck. Red Crane threw his spear as well, and it took flight on its own, attacking the captain continuously while he fought. Red Crane's first attempt to engage in melee was thwarted by the captain, who pulled him into a devastating knee strike. However, Red Crane eventually got the upper hand and by the end of the match, the captain was unconscious on the floor of the audience chamber. Chief Wan Li nodded "Very well, I will give you 5,000 spades to host a tournament on the first day of the Phoenix Moon (in 26 days)"
Red Crane bowed and said "Thank you chief, but is there any way you can see to increase my funding so the tournament can attract the best possible talent?" The chief looked annoyed and asked Red Crane to step closer to him. He then whispered a request in his ear. "Oh I could never do that sir. Please is there anything else you would request." "Very well, go to Sun Mai Temple, take the head of the Abbot and bring it to me. But make the killing appear like Qiang of Rong Yao is responsible and I will give you 20,000 spades for this tournament." Red Crane nodded and began investigating the matter. He dressed like one of General Qiang's men and went to the temple to burn joss sticks. He then waited for monks to come to the chamber and said as he burned the sticks "Bring me the abbot, for I wish to duel him fairly." The monks departed and the Abbot arrived. "You have angered the people of Rong Yao, and I am here as their champion." The Abbot said "You are mistaken, I have done no such thing." Red Crane Said "I am not mistaken, now face me." The Abbot became angry and threw his spade to the ground, getting in an open-handed stance. "Very well, if you insist on being rude we will trade blows." The Abbot was evasive and light but proved an easy foe for him to dismantle. Before the fight was even over the Abbot dropped to his knees and said "You truly are a great martial hero. I apologize if I have offended the people of Rong Yong, please tell them I acknowledge their grievances." Red Crane pointed his spear at the Abbot's throat. "Retire from the martial world and assume a new identity elsewhere, then I will let you live." The abbot assented, dropped his saffron robes and left the temple as stunned monks looked on. Red Crane nodded to them and went to speak with Chief Wan Li. Back at the Golden Way Sect Headquarters leaders of the Marital World arrived. These included Green Beggar, the masters of Perfect Heaven Lineage Sect, Laughing Fox, members of the alliance, and Iron Clawed Lion King. At the gathering Iron Clawed Lion King spoke, saying he had heard there was a weapon capable of killing the leader of the House of Paper Shadows. Shen Chun said there was such a weapon and it was called the Blood Dagger of Bao. Iron Clawed Lion King suggested they find this weapon before attacking the House of Paper Shadows. Iron Clawed Lion King also said he was also concerned about rumors that the House had defenses capable of slaughtering entire armies in an instant. Shen Chun assured him these concerns were unfounded. That night Shen Chun spoke with Little Red Mantis (his men had brought him to the sect headquarters that day). Little Red Mantis had approached Shen Chun months ago saying he knew about the Blood Dagger of Boa's whereabouts. Little Red Mantis said he could give the information for 1 million spades. Shen Chun paid and Little Red Mantis said that the spider demon and her special blade were to be found at the Liang Manor of the Invincible Ritual Masters. On his way to sleep, Shen Chun went to speak with Lady Plum Blossom but found she wasn't in her chambers. The next day his servant told him that Iron Clawed Lion King was dead, that they'd found him in his bed a moment ago. Shen Chun summoned physician Liao Cao who determined the cause was Plum Blossom Hellebore. He also said that it was ingested from his food. Shen Chun went to his kitchen to find out which cook had made his food. He learned that Cook Chan had done so, but hadn't been seen all day. Asking who Chan spent his time with, they said a nun of Tree Dwelling Nun sect named Cao Di. He went to Ferocious Flower's quarters and asked if he could see her disciple Cao Di. She informed him that she had not seen Cao Di since the night before. They sent their men to search and found two bodies. Cao Di was dead from Plum Blossom Hellebore at the bottom of the mountain peak. Chan had seemingly hanged himself in a tree in a nearby grove. Shen Chun spoke with Physician Liao Cao about making the death of Iron Clawed Lion King seem a heart attack. *Last session two people impersonated him and Da Mei Mei and killed innocent people. Decided to write this up after a small bout of insomnia. It is late so this is just a first draft. Just an initial idea more than anything else. But hopefully people can use this for a short adventure. This takes place in Yu Zhing, which is a city in Hu Qin in the Wandering Heroes of Ogre Gate setting. 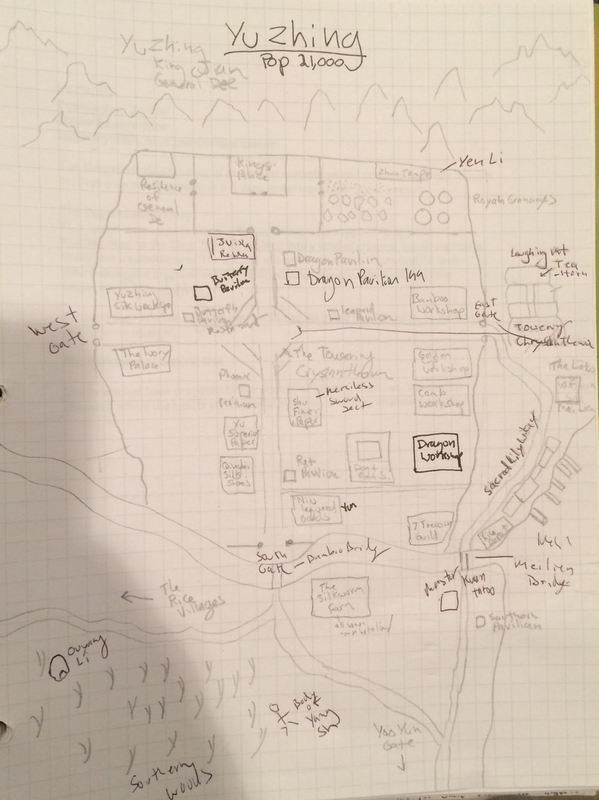 Apologies for the map, this is just a hand drawn one for my own campaign. The purpose of this is to have a really quick and easy to reference mystery adventure without as much detail to wade through. So the GM should probably be very flexible as players investigate. A killer stalks the streets and Yu Zhing, leaving a trail of bodies. Most have one thing in common: an axe in the heart and to ties Merciless Sword Sect. The trail of mystery leads to a righteous man gone awry, a wicked couple and a corrupt official who secretly leads the Thundering Hammer Sect. The wicked couple of Merciless Sword Sect, Yang Wenrou and Yang She had a wager with Divine Judge Juishao of Thundering Hammer Sect. Yang Wenrou and Yang She claimed they could turn the great and troublesome hero Lin Yuan into a greater evil than the three of them combined. Divine Judge Juishao felt Yuan's personality was too noble for such a transformation. They each bet their left leg. They set a date of one year as a deadline. The wicked couple tried for seven months and failed to turn Lin Yuan toward a darker path. Desperate, they agreed that Yang Wenrou should seduce Lin Yuan and trick him into harming the innocent so they could win the bet and keep their legs. Wenrou feigned a gentle and kind disposition. She befriended Lin Yuan at an inn in Hai’an and convinced him she was being chased by a corrupt official and his men, a man named Liang Bao. She asked him to help her escape to Yu Zhing, which he did. During the journey Lin Yuan fell in love with Yang Wenrou and she had an easy time laying the trap. In truth Liang Bao was a good man working to defeat the Glorious Emperor. She went to Yu Zhing knowing that Liang Bao was going to a meeting of like-minded righteous heroes at the Laughing Mountain Tea House in the Towering Chrysanthemum. So she made sure they got a room there, got Lin Yuan drunk, then told him that Liang Bao had brought his men to the inn in order to have her arrested so he could force her to marry him. Wenrou had fallen in love with Lin Yuan as well but dared not lose her leg to Thundering Hammer Sect so she continued with the plan. Jealous, drunk and enraged, Lin Yuan charged into the main dining hall and slaughtered Liang Bao and his men. Wang Wenrou fled and left him alone. Soon he realized his mistake and was filled with remorse and anger. He could no longer be the hero he once was but he vowed to make evil men pay. Years later he learned the full truth of what happened from a disciple of Thundering Hammer Sect who told him about the bet between Divine Judge Juishao and the wicked couple of Merciless Sword Sect. He killed the man on the spot and returned to Yu Zhing to get his revenge (killing any Merciless Sword Disciples he could find along the way). When news of this reached Yang Wenrou, she both feared for her life and realized that Lin Yuan could be with her once again. She had grown more in love with him in the intervening years, and guilt had taken root as well. She murdered her husband and left his body in the forest outside the city. She then went to the Towering Chrysanthemum to await Lin Yuan. 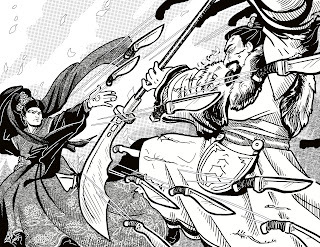 Eager to save himself, Divine Judge Juishao hires the heroes to get to the bottom of the murders and bring the killer to justice at the edge of a blade. He knows perfectly well who is behind the killings. But he wants Lin Yuan killed by someone else's hand. As a local magistrate he empowers the party with the authority to execute the killer and makes them constables. The players are hired by Divine Judge Juishao to investigate the killings of members of Merciless Sword Sect. 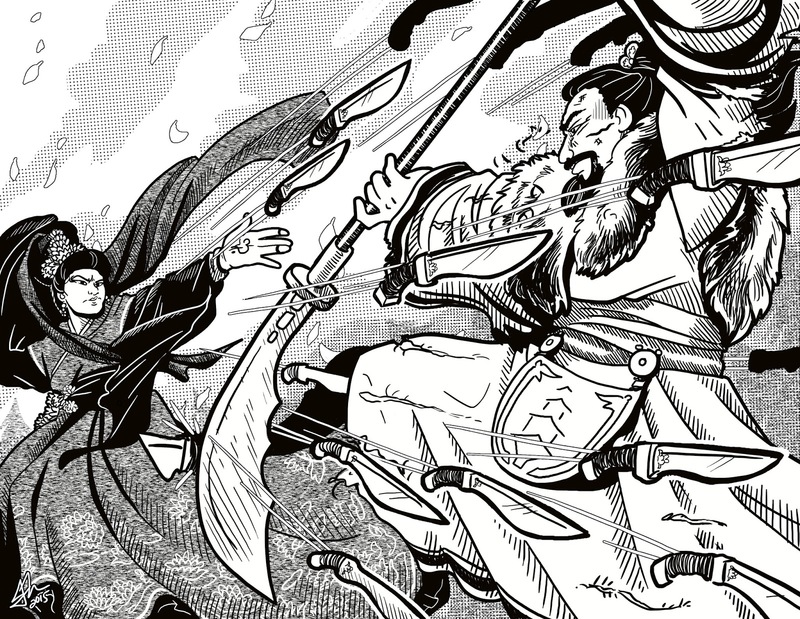 Juishao’s past connects him to the case, which he conceals from the party, but he knows the killer wants to murder him as well, so he hopes a skilled group of martial heroes can bring down his enemy. The trail leads to the murder scene of Yang She, killed by his wife. Which may lead the party to the Towering Chrysanthemum. New victims emerge and clues tie them to Thundering Hammer Sect. A secret organization of disaffected and malicious officials led by Divine Judge Juishao. If the players learn of this, Divine Judge Juishao could become their enemy and seek to have them killed. If at any time Divine Judge Juishao has concerns about the PCs suspecting his involvement in the massacre, he will send Thundering Hammers after them. Roll on both of these each day. A body and rumor will arise helping lead the players deeper into the mystery. People in the city know the players are on the case, so news of the rumors and bodies are brought to them by assistants appointed to them by Divine Judge Juishao. The players should be able to acquire this information more quickly through investigative efforts. For this simply use your best judgement about what clues might be available throughout the city. These entries are extremely bare-bones, so the information is easy to find. Basically a sentence and a clue. SHU FINE PAPER: A paper producing facility that is a front for the Merciless Sword Sect (a group of assassins). The sect leaders, Yang She and Yang Wenrou started acting weird when first body appeared and headed south of the city together (haven’t been seen since). Ban Leng is the foreman, but it is possible he is dead by the time the players come here. TOWERING CHRYSANTHEMUM: This multistory structure contains tea houses, inns, and restaurants. It rests atop the four-way road intersection in the center of the city. The owner remembers the slaughter commited by Lin Yuan years ago.When Yang Wenrou returns here, she goes to the Laughing Mountain Tea House. She is on the cusp of confession or slaughter. LAUGHING MOUNTAIN TEA HOUSE: See TOWERING CHRYSANTHEMUM. 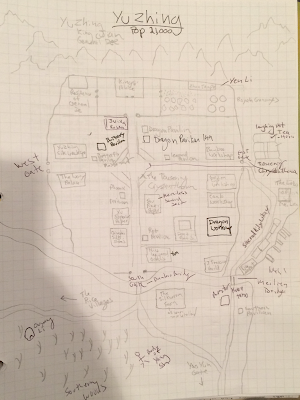 SACRED LILY WAY: If the players ask around here, roll on the clue table again. OUYANG LI: A former member of Merciless Sword Sect. He left after Yang Wenrou confessed her love of Lin Yuan to him. He was disgusted by her lack of commitment to the sect’s ways and became a hermit outside town. He also witnessed the murder of Yang She by Yang Wenrou (and he was not surprised by it at all). DIVINE JUDGE JUISHAO RESIDENCE: This is a large courtyard house belonging to Juishao. However the servants here can attest that there are secret meetings in the gardens of local officials. These are meetings of Thundering Hammer Sect. His servant Pei Buwei is secretly a member of Thundering Hammers. RICE DEPOT: Lin Yuan works here during the day porting rice to the ships. YU SUPERIOR PAPER: The workers here despise the inferior products of Shu Fine Paper and made a point of following She and Wenrou when they left. They saw Wenrou return from the woods heading toward the Towering Chrysanthemum. LOTUS OF MEI LIEN INN: This is a inn where Lin Yuan is staying. Divine Judge Juishao is missing his left leg. He wields twin hammers and uses the left one to compensate for his missing leg. However he pretends not to know martial arts and conceals his hammers at all times. The judge was involved in the business surrounding the massacre ages ago and just wants this to go away. He is hoping that the party will simply kill Lin Yuan but is terrified that his connection to Thundering Hammers will be revealed. Hurl of the Hammers: You smash your hammers into two different targets, then throw them at two other targets. Make a Medium Melee Skill roll against the Parry of 2 targets, rolling normal damage on a success. Then make a Medium Skill roll against the Evade of two more targets, doing normal damage on a success. Cathartic: As above but each attack does 1 Extra Wound. The Thundering Hammers are officials who enjoy indulging in illegal activities. Most have a particular vice that draws them to the organization. Lin Yuan was once a righteous hero now he is filled with remorse and anger. He also still carries the pain of the betrayal of his affection. He is venting his rage at those he believes to be responsible (see the background information above). However his personality has changed due to those events. He enjoys killing now, and when he is done with his revenge, he will continue to kill. If the party stands in his way, he will not hesitate to kill them. He is only just beginning to realize the reality of these intentions. He is staying at the Lotus of Mei Lien Inn. Lin Yuan wears fancy green robes and fights with an axe. Slaughtering Axe Blade: You throw your axe in a line through multiple foes. Roll Medium Melee against Evade of up to 6 Targets (the axe can curve to hit them but they must be before you). On a success do Normal Damage plus 3 Extra Wounds Each. Cathartic: As above except does Normal Damage plus 5 Extra wounds. Must retrieve axe after. Yang She is the husband of Yang Wenrou and the co-chief of Merciless Sword Sect. He is dead, so has not stats. Yang Wenrou is one of the leaders of Merciless Sword Sect. When their disciples started getting murdered, she killed her husband and returned to the Towering Chrysanthemum. She has no interest in leading Merciless Sword any longer. Over the years her love for Lin Yuan has grown, while her hatred for her husband and all he stands for has increased. She is willing to tell the players her side of the story if the PCs find her, as she has bottled up her feelings for a long time and wishes to vent them. However she will not let them stand in the way of her re-union with Lin Yuan. She is also slightly unhinged at this point, not sure if she wants to love or kill. Though not a member of Heiping, she had a sister who was a Heiping Nun and secretly observed her training to learn some of their techniques. Rising Swan Strike: You lift into the air and spin around, slicing all around you before leaping away to safety. Make a Medium Melee attack roll against the Parry of all adjacent targets. On a Success you do Normal Damage and can make an Athletics Roll TN 7 to leap 40 feet in any direction. Cathartic: As above except you to Normal Damage plus 2 extra wounds and can leap 80 feet in any direction. These are assassins who enjoy killing and make a point of eliminating all witnesses, no matter who they are. They can be found at Shu Fine Paper.